Although it functioned below-ground as a water filtration plant, above-ground McMillan Park was just that–an open green space with a playground, tennis courts, picnic areas, and a dance pavilion. Landscape architect Fredrick Law Olmsted, Jr. designed the site to be part of the “Emerald Necklace,” a chain of parks encircling Washington, DC along the high points of the city, primarily hilltops with extensive views that were suited as peaceful reprieves from bustling city life. Influenced by the City Beautiful Movement, Olmsted Jr. and the Senate Park Commission set out to create a comprehensive plan to preserve park space and provide for the recreation and health of the growing city. 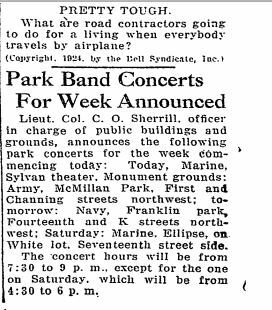 Friends of McMillan Park recently unearthed some articles from the Washington Post documenting McMillan’s use as a concert venue in the 1920s. Of particular interest is the address mentioned in the articles–First and Channing Streets Northwest. While much of McMillan’s recreation activities happened on the west side of First Street, (where the reservoir is located) Channing Street is on the east side of First Street. Why does that matter? The 25-acre eastern portion of McMillan Park is the site that the Gray Administration wants to demolish and rebuild. Proponents of the Mayor Gray’s plan often claim that the site was never used as a park. Here is more clear evidence to the contrary.